Thursday, November 23rd is Thanksgiving day! We love doing the Fall and Thanksgiving gift baskets with the beautiful ribbon colors and decorative Fall leaves and enhancements, all filled with favorite gourmet goodies of the season. The Cornucopia baskets are a favorite and often used as a festive centerpiece on the Thanksgiving table. The Holiday Tray is another popular gift basket and is filled with an assortment of sweet and savory gifts for the whole family to share. Thanksgiving is also a great time to thank special clients for their business! We can custom design Thanksgiving themed client gifts to match your budget. We have white chocolate pumpkin almonds, gingerbread biscotti, apple spice tea, cranberry nut mix, award winning cinnamon spice cookies, and too many more yummy, seasonal goodies to name, including new chocolates and confections! Fresh fruit and gourmet baskets and wine and cheese baskets are also popular! 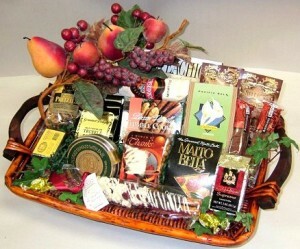 Give us a call today to arrange special Thanksgiving gift baskets for clients, friends and family.